It’s no surprise that the betting industry is one of the most competitive markets out there. With the shift from in shop to online gambling and the huge potential market, more and more betting companies are appearing each year. Take 888Sport and Smarkets for example. Both companies were founded in 2008, neither of which have any shops on the high street. If you ask most punters about these two sites they’ll definitely know them and probably will have used them. Compare this to Ladbrokes who were founded back in 1902. Granted, Ladbrokes are loads bigger than both 888 and Smarkets with 2016 revenues of over £1.5 billion. However, you can see it takes far less time nowadays for a betting company to become prominent in the market. Why is the Betting Industry so Competitive? Lower boundaries to entry. As we’ve already mentioned above there’s more and more companies appearing each year. Thanks to the Internet it costs far less to start an online platform than to open a shop on a high street. With the number of bets placed dwindling in stores and more people betting online, this trend in set to continue. The potential market. Another reason why the industry is so competitive is due to the potential market. The total gross gambling yield between April 2015 and March 2016 online was £4.5 billion. This makes online gambling the largest gambling sector in Britain. That data will drive any gambling company start-ups. Is the Gambling Market Saturated? With all these betting companies around is the gambling market saturated? There are hundreds of bookies online all competing for the same business. This is great for us matched bettors however, for normal punters there is so much choice. Arguably too much. Where do punters place a bet on the weekend’s football? Through research it seems it comes down to brand recognition. People are heading to the more established companies like Bet365 and Ladbrokes which have both been around for a long time. This links into the marketing efforts of each brand. Though the gambling commission are getting ever stricter on the industry as a whole, there are still no restrictions on how much each company can spend on marketing. It depends on their own strategy. At 888Sport, they increased their total marketing spend from £52 million in the first half of 2015 to £70 million in 2016. This extra spend saw new customer recruitment for sports betting increase by 82 percent. This increased marketing effort undoubtedly had a number of free bets and promotions available to new customers. That’s where matched betting comes in. Matched betting is a method to make money online taking advantage of the competitiveness of the industry. As there are so many companies, each bookie needs to do a lot to gain a new customer and even retain existing customers. They do this by offering countless promotions and free bets to incentivise punters, as we’ve mentioned above. Ben Cleminson, company director at Square in the Air, said bookies are willing to spend up to £300 per new account registration. That means there’s an awful lot of free money available. Matched betting is a technique where we can exploit this free money and make a guaranteed profit. We use a method called back and lay betting which cancels out any risk there is in a normal bet. This makes matched betting a risk free method to make money online. I don’t know of another way to make money online with zero risk. Why not sign up for a free trial today, see what we’re talking about and make £45 straight away. Get access to the latest betting tips and tricks right now. Charles is the founder of The Sure Bettor. 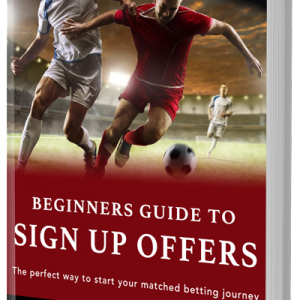 He built the company with the aim of 'getting the word out' about matched betting. What is line shopping? Should you use this strategy in 2019? Matched betting is not gambling. However, if you are concerned about gambling visit either of these pages.